RARE MOMENT—It seldom happens that writer Merle Constiner is seen away from his typewriter, even for a few minutes. 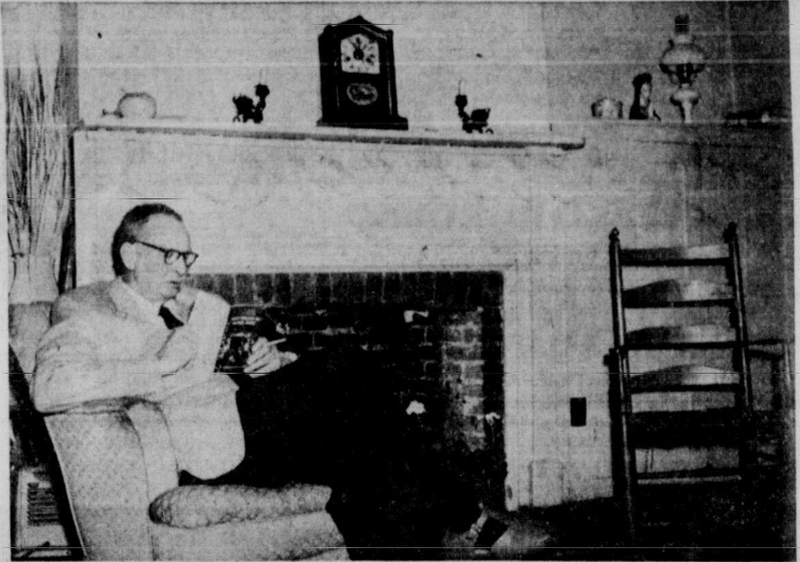 Here in one of those rare moments he is pictured in the living room of his 130-year old home in Monroe. This article about one of my favorite historical mystery and western writers was published in the Middletown, Ohio Journal on April 20, 1958. Constiner created two well-regarded series for Black Mask and Dime Detective, and I enjoy them, but i enjoy his historical fiction in Blue Book and the Country Gentleman more. The definition of an “adult Western,” Steve Allen says, is that 20 years ago a cowboy was in love with his horse; today, he’s still in love with his horse— but he worries about it. Merle Constiner, Butler County author who lives in a 130-year-old house in Monroe finds that adding some Western lore to his writing activities brings variety into his profession. Constiner, who in the past has written historical short stories and novelettes for magazines, has recently finished his second Western novel. They are not "just" Westerns, or even adult Westerns; the novels could almost be called periods, because Constiner deals with such factual material as the vicious cult of "neckerchief fighters" in his book, “Last Stand at Anvil Pass," published in February 1957. As a modern writer is Constiner merely following the popular trend of television, motion pictures and fiction? “I’ve always liked to read Western background, ’ he said. Too, his interest can be traced to his historical fiction training. Most of his dozen full-length magazine serials and his many other short stories are placed in southern Ohio in the period just before and after the Civil War. Background includes riverboats, the turnpike and the vicinity from Cincinnati to Springfield. During his years as a professional (since his first published story in 1929) Merle Constiner has formed his own pattern as a writer. After studying at Wittenberg College and Vanderbilt University, he discovered the pride of a “first” published story and decided to become a full-time writer. That was in 1939. Constiner organizes a story before he begins to write and then works eight hours a day at the typewriter. Usually it takes from two to three weeks to complete a short story—even longer if it's a historical, because of the research. But since each story is different, a set pattern is impossible. Besides seeing his stories published, Constiner has also had the satisfaction of knowing that one of his Westerns was presented on television. The live show, televised in 1953, starred Fred MacMurray. “I didn't get to see the program," said Constiner. “But a friend told me that MacMurray got confused on some lines of the dialogue. Later, we found out that it was only two days after the death of his wife. He had gone on with the show, anyway." Whatever the writing chore— mystery, historical, Western— whatever the form—magazine, hard back, paper back—they all form a “well-rounded program,” which adds variety and zest to Merle Constiner’s creative life. Merle Constiner is a big favorite with me also. First I got hooked on his complex detective cases starring The Dean in DIME DETECTIVE and Luther McGavock in BLACK MASK. Then I discovered his historical adventures in ARGOSY, ADVENTURE, SHORT STORIES. I also managed to find all 5 parts of his serial in COUNTRY GENTLEMAN which I don't believe has ever been reprinted. Then I found out about his dozen or so western paperbacks. I agree, he is exceptionally interesting, and deserves to be kept in print. I'm mostly familiar with his westerns, which I've read all of. They vary a bit in quality but are always worthwhile, and are definitely unlike any other books in the genre. He creates a unique world in these novels, full of odd details and unusual descriptions of landscape that really make the books stand out. My favourite is the first one, Last Stand at Anvil Pass. He also wrote three juveniles which are well worth checking out.